I'm told that people like to collect together from time to time for a thing that's apparently called a "party." I've been to a few of these "parties," but only very rarely. I thought they only happened once every 4-5 years, but it seems they go on damn near all the time, at least somewhere. At these gatherings, people play games. 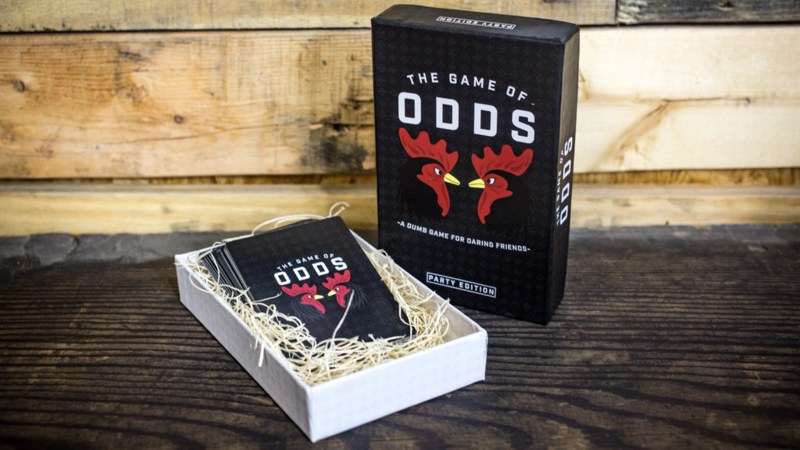 One such game that people might play is The Game of Odds, a new party card game up on Kickstarter. In the game, players draw a card that has a particular dare on it. They then say what the chances are of them doing that dare (as in "1 in 5" or "1 in a million" ... though that last one wouldn't work so well, as you'll see in a minute). Then, one other player and them says a number that falls into that range. If they both say the same number, the player that drew the card has to perform the dare. If they say different numbers, it moves on to the next player, but the chances go down by one (so "1 in 5" turns into "1 in 4" or "1 in a million" turns into "1 in 999,999). Eventually, it'll get to a point where the person has to perform the dare. If you do perform a dare successfully, you keep the card. Collect 3 to win. The Kickstarter campaign is up and running now and is set to go for another 29 days.